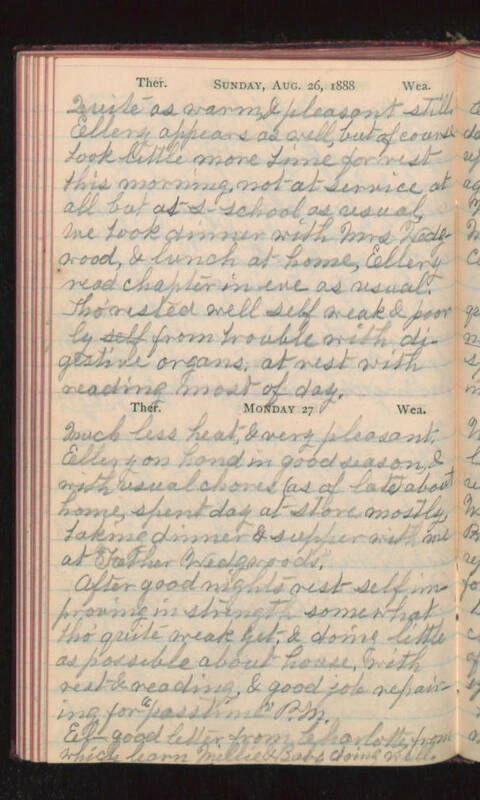 Sunday, Aug 26, 1888 Quite as warm, & pleasant still. Ellery appears as well, but of course took little more time for rest this morning, not at service at all but at s-school as usual. We took dinner with Mrs Wedgwood, & lunch at home, Ellery read chapter in eve as usual. Tho' rested well self weak & poorly from trouble with digestive organs, at rest with reading most of day. Monday 27 Much less heat & very pleasant. Ellery on hand in good season, & with usual chores (as of late) about home, spent day at store mostly, taking dinner & supper with me at Father Wedgwoods. After good nights rest self improving in strength somewhat tho' quite weak yet, & doing little as possible about house, with rest & reading, & good job repairing for "pastime" P.M. El- good letter from Charlotte, from which learn Millie & Babe doing well.